If you own an Android phone with expandable memory, today’s your lucky day. 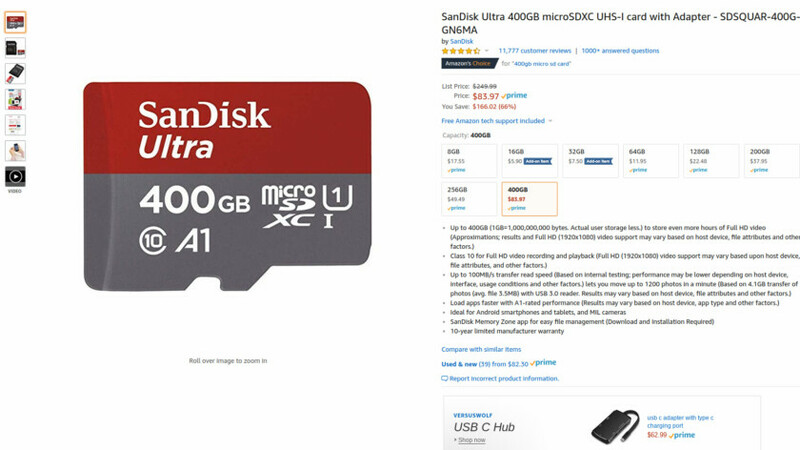 For a limited time, you can pick up a SanDisk Ultra 400GB microSD card on Amazon for just $83.98. That’s a discount of $166.01 from its normal price. This is a Class 10 microSD card, which supports Full HD-resolution video recording and playback. If you want 4K video recording and playback, you’ll have to step up to an Extreme microSD card. This particular microSD card also supports up to 100MB/s read speed, though the write speed is lower. Best of all, the microSD card carries an A1 (App Performance Class 1) rating. That means this particular card is fast enough for apps and media storage on a smartphone or tablet. That is why SanDisk recommends this card for Android smartphones and tablets, along with MIL cameras. Of course, you can use the microSD card with any device that supports expandable storage, such as the Nintendo Switch. Thanks to the included SD card adapter, you can also use it with your computer. SanDisk’s microSD cards each come with a 10-year warranty. You can also use the SanDisk Memory Zone app for device and microSD file management. Grab SanDisk’s 400GB microSD at the link below.